I was literally floored upon first viewing this amazing prototype! 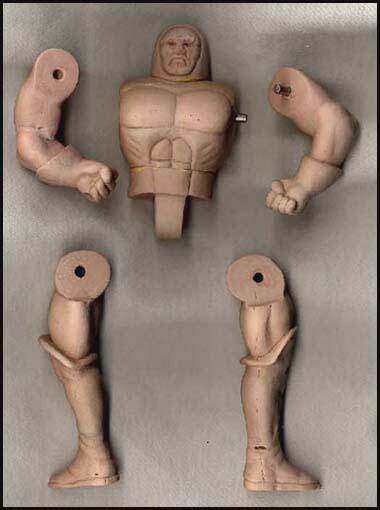 What you see above represents an early conceptual sculpt of the second series villain, Darkseid. Wax sculpts represent the pinnacle of prototypes for many collectors. 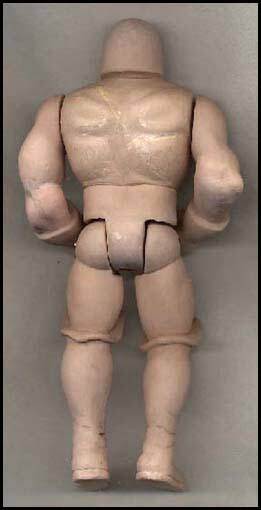 Sculptors often go through various stages during the sculpting process of an action figure before a final approved wax master is created. Since approval from DC Comics was required for each character, changes ranging from incredibly noticable to miniscule were often required in order to ascertain final approval from the company. This sculpt likely represents one of the earliest preliminary incarnations of the figure and quite possibly the earliest form still in existence. Later version sculpts typically exhibit plastic discs embedded into the torso, arms, legs, and head at the attachment points. Keep in mind this prototype is a true work of art since it is sculpted entirely by hand! Above we see a view of the sculpt in its disassembled state. Take note that each leg is sculpted in one piece as opposed to the final version which featured a two piece leg. Notice the head and limbs attach to the torso via small dowels in the same fashion as a hardcopy.